Find One or Two Trusted Regular Babysitters– We love our babysitters. Not everyone can afford to do this but we pay someone to come in for a few hours to help out whichever parent is at home with all four kids at night. This allows us to get everyone’s homework, reading, and bath fit in before bedtime (without losing our minds). We typically plan our overnight trips after we’ve checked her availability. We have two babysitters that are best friends and together they can handle all four kids, which is great for nights when we both have something. Keep a Shared Calendar– We use a iCloud calendar that we share between the two of us on our phones. We also have one that we share with our babysitter. I know a few people that also use a google calendar which works the same way. Plan Ahead– A shared calendar is great but failing to plan ahead can leave you without someone to help with the kids. Garen and I both plan our work schedule a minimum of two weeks out. When we have an out of town obligation, we plan that with our babysitters or family members as soon as we know about it, usually at least a month or more out. Just Say No– If I know that Garen is already going to be out of town or there is a school or extracurricular event for the kids, I may have to say no. And that’s ok. You can’t be everywhere all the time. This is harder said than done sometimes for a workaholic like me but I’m fortunate to be working with people that understand that family comes first. Divide and Conquer– When both Garen and I are going to be out of town we sometimes send the kids different places. For example: On a weekend trip we will try to plan a night out when the big kids are at their Joe Daddy’s and find someone to keep the twins. One person keeping all four by themself can be done but it’s tough and we never expect that of a family member or one babysitter. Packing List– We use an app for packing the kids bags for when they are going to stay out of town while we are gone. It helps us to make sure we don’t forget anything and we can use the same list over and over again quickly. Keep Convenience Foods at the House– I’m all about saving money and eating healthy homemade meals but there are times when we need something fast. We buy a few frozen dinners such as chicken strips and steamer packs of vegetables so that they can be quickly made. We also always have frozen pizzas in the freezer for babysitter nights. This will ensure there’s always dinner at the house and it’s easy for whoever is staying with the kiddos. It’s not always perfect but at least these things help us to make things as smooth as possible. 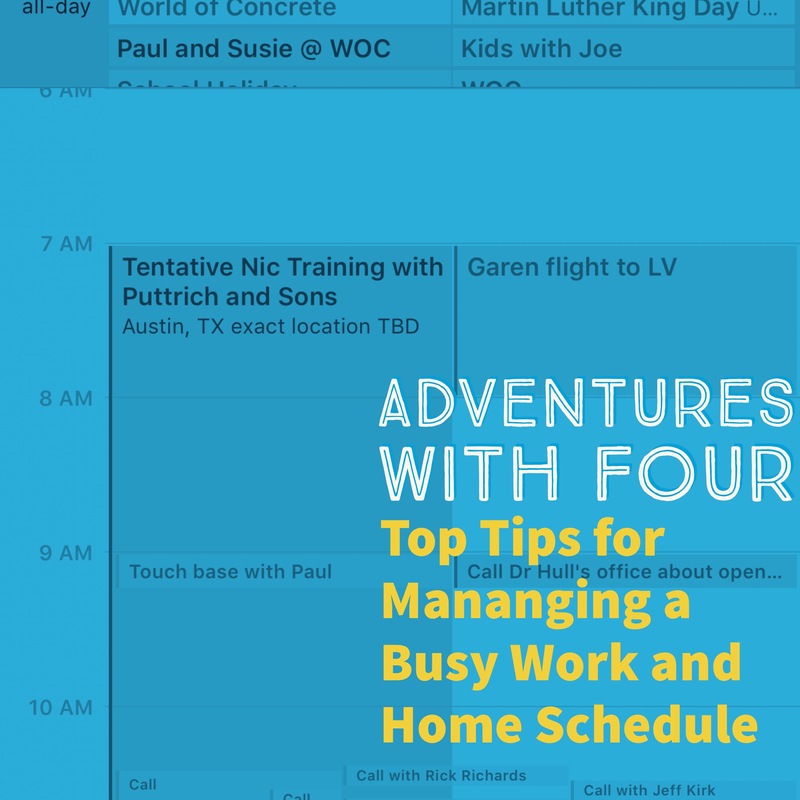 I hope these tips can help you if you’ve got a busy schedule like ours.